The market may seem crowded with non-surgical clinicians, which may see medical professionals shy away from the industry. However, the profitability of the non-surgical industry is very attractive, especially dermal filler treatments, therefore this should not be overlooked if you are interested in increasing your income. The non- surgical industry is still new and is one of the fastest growing industries in the world. Meaning, customers wanting non-surgical cosmetic treatment is growing due to an ageing population with more disposable income and the youth market growing appetite for self- improvement. There is a huge gap in the market for skilled clinicians since many are providing the service sporadically while holding on to their full time position. Some clinicians fail to improve their technical skills before they treat paying clients, who result in disappointment and non-returning clients. This article will demonstrate the dermal filler profitability and benefits of offering dermal filler treatments in your practice. 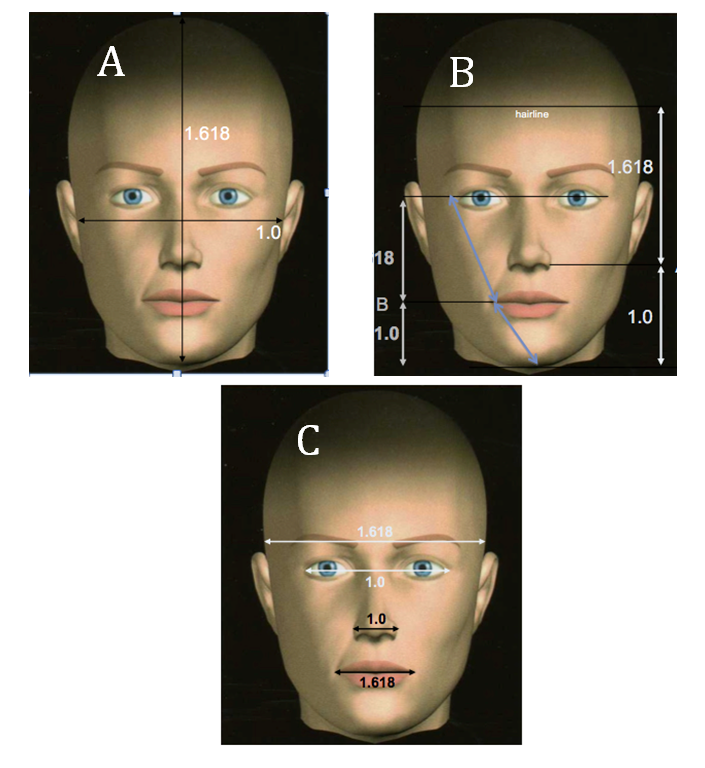 The pictures demonstrates a “perfect” face and how various proportions taken from differing points of the head (level of the hairline), eye (lateral canthus), base of the nose, mid lip line and base of the chin can give rise to the concept of Phi. Exceptionally beautiful and young individual may fit these ideals, however as we age these proportions will be compromised. Bone reabsorption, skin laxity and muscle laxity will cause both gender to look less attractive. Females tend to take on a more androgynous appearance as they age. Dermal Fillers treatment is truly spectacular for recreating beauty in a female face. Better yet the treatment last for up to 9 months, which makes it more affordable than muscle relaxant treatment for the average person. For instance, image C implies that if the width of the nose measure 1 then the ideal width of the mouth should be 1 x1.618. Fifty per cent of young females do not meet these ideals and it appears from the demand for lip augmentation treatments that females and some males are requesting this treatment. Mature females will develop oral commissures (deep lines in the corners of the mouth), which reduce the width of the lips and changes the ideal proportions. Injecting fillers in the corners of the mouth will widen and lift the corners of the mouth creating a youthful appearance. Fillers stimulate the skin and instantly recreate youth and attractiveness in any individual facial features. Image A, states that the ideal width of the cheeks to the entire face should be (width of the cheeks x1.618). Ageing will decrease the width of the cheeks because of skin laxity and thinning of the dermis. Cheeks lifting can resolve this problem by injecting a HA dermal filler such as VOLUMA in the cheek area to lift the cheeks. In short VOLUMA (highly viscous dermal filler) is used as a scaffolding agent to replace the degrading collagen fibers in the dermis. Your costs for the dermal filler training course will be between £600 and £780 depending on the option you choose. This will be recovered after treating 3-4 patients. The profitability of providing dermal filler treatments is also very attractive. 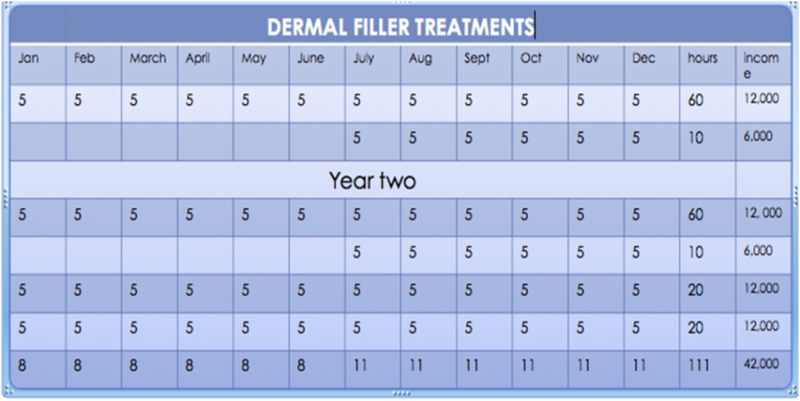 Lets look at the revenue potential of providing just 5 dermal filler treatments in a month. If you are a dentist, doctor, pharmacist or nurse with a current business or private medical practice, this objective should be easy to achieve. Lets review the numbers. For example a syringe of filler will cost the practice approximately £75 to £90. The market price for a dermal filler treatment starts at £300 to £350/for 1 syringe of filler to be injected in any area of the face. In this forecast, I estimated a profit of £200/each treatment assuming the clinician only used 1 syringe. In year 1 if the practice focused on getting at least 5 clients a month by using creative marketing, the practice will have treated 60 patients for the year and generated £12,000 in profit. The estimated time it takes to treat a new patient is 1 hour since ½ hour is spent consulting with the patient and ½ hour to treat the patient. Here is the magic of repeat patients. Say you are great at your treatment outcome and your patients like your work and say the first 30 patients from January to June returns for a second treatment in July to December of the same year. The 30 repeat patients will generate an additional £6000 to year 1 revenue but the time taken to generate the £6000 will only be 10 hours and not 30 hours. Repeat patients will not require a consultation which saves you 15 hours and your treatment time will decrease by another 20% so repeat patients are more profitable for the practice than new patients. The reason that many fail in this industry is the lack of commercial awareness. A lawyer, accountant, engineer and artist must be good at what they do to sustain long-term success and to keep their customers happy. The same is expected of medical professionals in the commercial world and producing stellar treatment results is a must to succeed in this industry. 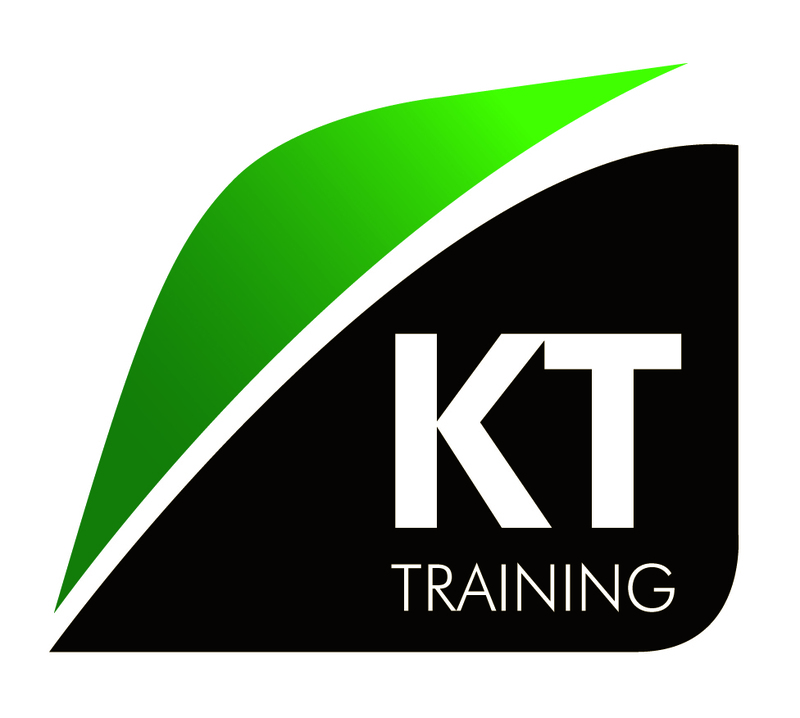 For the last 12 years, KT Training has provided the highest level of clinical training with extensive practical experience. But what makes us great is our support, commercial awareness and how we mentor our candidates on the path to success. The CEO of KT Training (Yasmin Khan) is the only individual to write 2 books for medical aesthetic practices. Yasmin also provides a complimentary practice start up guide to for all our candidates. 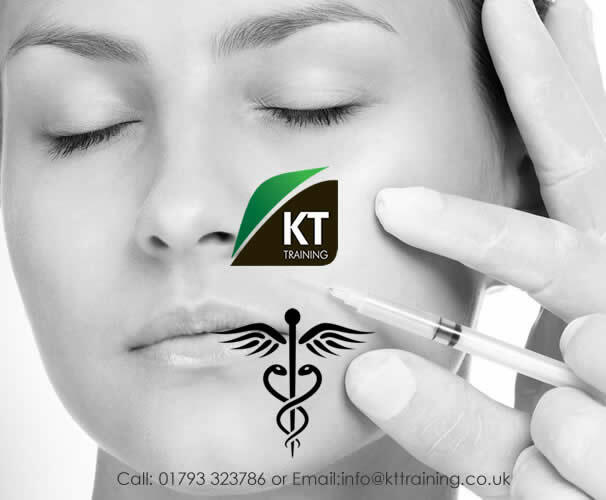 For more information on our company and the dermal filler training courses please contact us.